Former Manchester United captain Paul Ince believes his former club should not have let Danny Welbeck leave. Welbeck, 23, who had been at Old Trafford since the age of eight, joined Arsenal for £16m in September. The England international is in line to face his former side when they visit the Emirates Stadium on Saturday. "When he left Manchester United it was a shock. He has got pace to get behind teams and create gaps for others to exploit," Ince told BBC Radio 5 live. "I think it was a bad, bad decision to let him go. He offers something different to what Manchester United have got. "They haven't got pace - (Wayne) Rooney is not the quickest, neither is (Robin) van Persie and (Radamel) Falcao is injured. "Since he has gone to Arsenal his performances have been fantastic. I don't think he has got anything to prove to Manchester United." 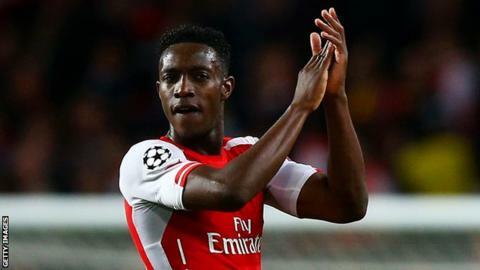 Welbeck scored 29 times in 142 United appearances, but since his move he has found the net five times for the Londoners in 12 appearances. Rooney believes his former club-mate did the right thing by leaving United to join Arsenal. "For Danny, and his own career, it was probably the best move for him," United captain Rooney told MUTV ahead of Saturday's trip to the Emirates. "He's done great and scored a few goals. Danny gives you what he always gives you - a good shift." Rooney, who played alongside Welbeck for England against Slovenia and Scotland in the recent international break, admits it will be strange playing against his former team-mate. "Of course, Danny has been here all of his life," Rooney added. "He is a Manchester lad so it is weird seeing him there. "Long injury list or not, Manchester United just do not have the players to go to Emirates Stadium and sit there and be hard to beat. This looks like being an open game, which will suit Arsenal, and I do not know how United are going to cope with in-form Gunners striker Alexis Sanchez." United have yet to win an away game in the Premier League this season and are seventh in the Premier League, one place and one point below Arsenal. "Arsenal have got a good squad, an exciting squad with a lot of young players and a lot of English players which is great for England," he said. "We know they play with a lot of energy and we'll have to be at our best to beat them. "It's always a tight game and whoever gets the first goal normally wins or gets a result." Fixtures between Manchester United and Arsenal have proved highly competitive affairs down the years, with both teams often competing for the Premier League title. However, Ince believes the encounters have lost a bit of their sparkle in recent years. "Arsenal v Manchester United is always a massive game - history shows they have been fiery occasions. But when I look at the two sides now they don't carry the same calibre of players as they used to," added the 47-year-old. "We always wanted to see the likes of (Roy) Keane, (Patrick) Vieira and (Tony) Adams, and look at what kind of battles would go ahead in that game. Now it doesn't carry as much substance."